The queen marking cage makes it easy for anyone to mark their queen. 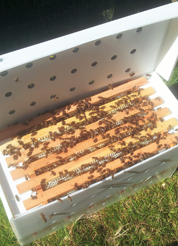 Simply find the queen and press the cage over her and into the comb, it's okay if you catch a few workers in the process. Once it is secure you can carefully mark the queen on her thorax with a queen marking pen, the colour for 2019 is green.